I know pumpkins grow in our area because the local University has acres of them growing not more that 5 miles away. If you have any pumpkin growing tips, I'm all ears because not one to be easily discouraged, I know I'll be out there again next year, pumpkin seeds in hand, trying all over again. In the meantime, thank goodness for the local pumpkin patch. We're taking the grand kids later this week so I'll have pictures to share soon. I look forward to gpoing to the pumpkin patch every year. I seriously am sad if I don't go. I went on Octber 1st, hah. 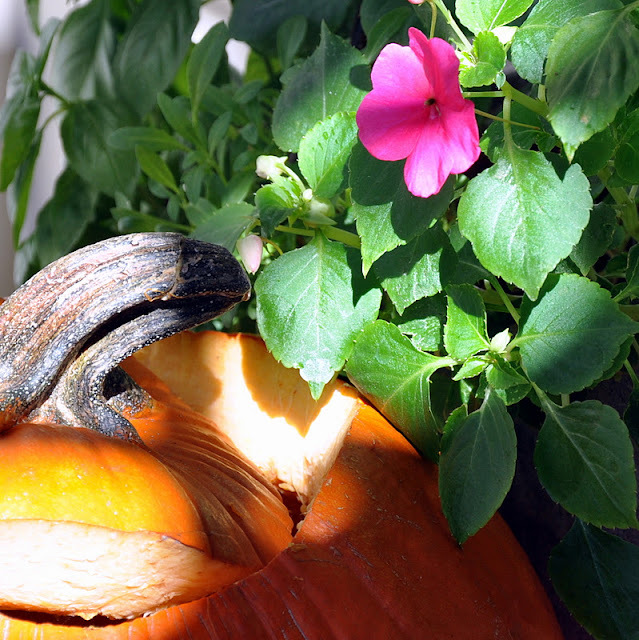 I have pink impatients next to my pumpkin. I just can't dump them when they are still so pretty. I love pumpkins too and I don't know what tips I could give you for your growing area. They grow quite well here in Michigan. I just throw the seeds in and do not much more than that except to water. I wish I could help you out. My pumpkin patch was sad this year... not many pumpkins due to our strange summer weather. I think it may be the seed causing your poor growing. I plant ALL the seeds I buy and usually only have about a 30 or 40 percent success rate with them so "over planting" is a good idea. You can always "weed" some out if necessary.... And of course, lots of water! Patty, I love them too. 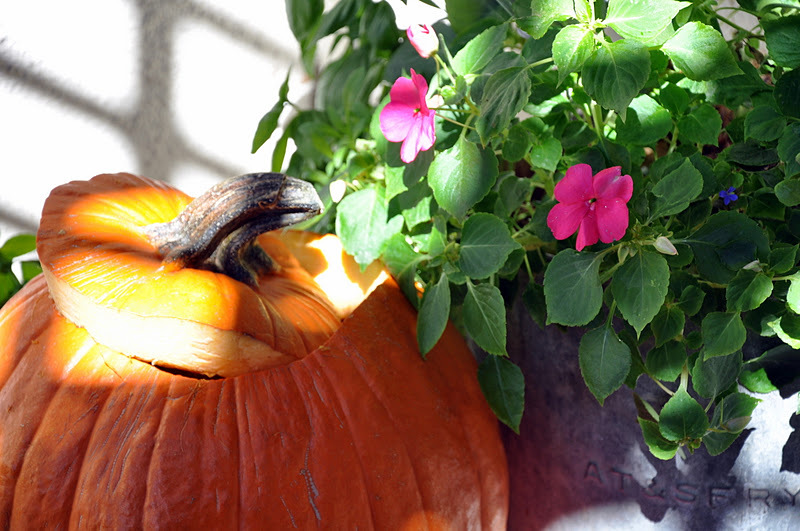 There is something so comforting and inviting about a pumpkin. I spilled pumpkin seeds all over the rocked part of our backyard and had vines everywhere. Wish I have not pulled them up...now. Good morning. I too have tried and failed with planting pumpkins. I have a large space to grow them, and they start off great, then just wither away? It is a mystery. I didn't plant any at all this year. But my neighbor did, and he has them? Go figure!!! I haven't tried growing pumpkins, but I like the play of light on the one you photographed! I hope you're able to get some good advice. Beautiful photos, even if it's not your own home grown pumpkin! 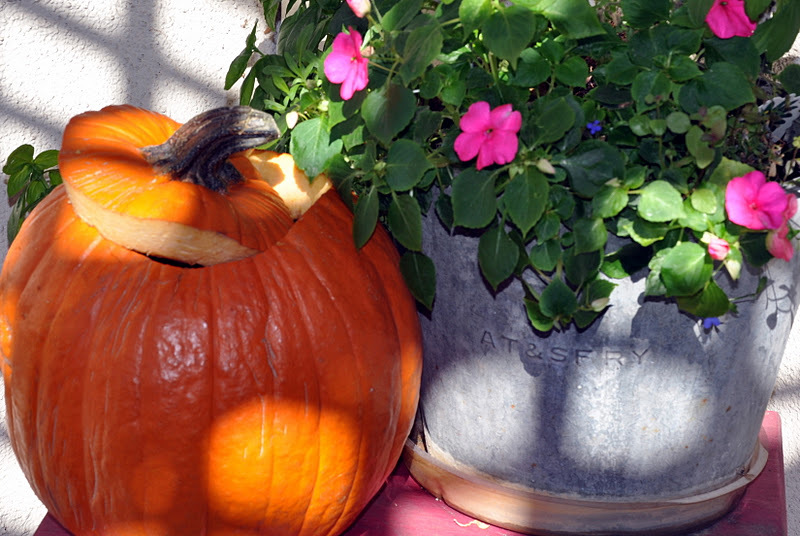 Have fun at the pumpkin patch with your grandchildren this weekend! We grew pumpkins when the boys were small...the funny thing is that they started turning orange in July and they wanted them for their Halloween party...we had to pick them and hide them in all the closets in the house until the beginning of October when we took them out to ripen...those were great times and you just brought back those memories...Thanks!! If you are getting blooms, then it sounds like it's a pollination problem. I'm sure you must have bees because of all the lovely flowers in your garden... If not though, you might have to take the male blossoms around to the females and do a little bee simulation. Ask the university farm about their success. It's only five miles away, but five miles could be a big difference in the micro climate of your home area. Are you too cool for pumpkins ~~ as in near the coast? I really don't know... I'm just throwing out some suggestions here. Mostly I just wanted to say Hi! Yes, thank God for pumpkin patches, else I would have none. I have never grown pumpkins, so can't help you with that. I love your pictures. As beautiful as your garden is, I'm suprised you have trouble with anything. I haven't grown pumpkins since my boys were in nursery school, so I can't help. Going to the pumpkin patch is always fun. We live in zone 5 and the only thing I have learned about pumpkins is that they take a long time to grow and we have to start them in Feb or March in order to give them the start they need. Hmmm, I just checked your profile, California shouldn't have a problem with a long growing season! Lol, maybe you need to hand pollinate?